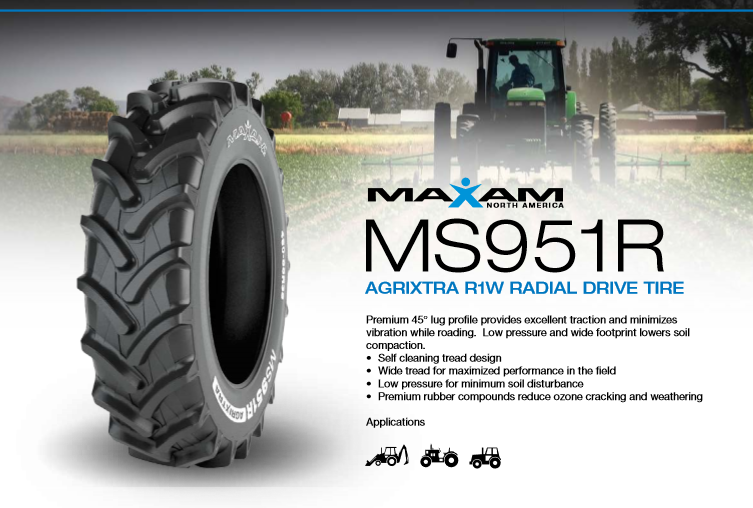 Meet the MAXAM MS951R AGRIXTRA R1W, an exciting new entry into the U.S. rear radial agricultural tire category. The product is designed for high-horsepower tractors and harvester equipment applications. The MAXAM MS951R AGRIXTRA provides impressive traction on a variety of wet and dry conditions with an advanced tread design and wide footprint to lower soil compaction and minimize soil disturbance. The intelligent self-cleaning tire tread pattern ensures maximum performance in the field, while the premium 45 ° lug profile increases overall ride comfort, reducing vibration on hard surfaces and roads. The MAXAM MS951R features premium compound technology with a reinforced lug design construction for superior quality and proven protection from ozone cracking.